Jamuna Bank Limited Management Trainee Officer Job Circular 2016. Recently A job circular has been published by Jamuna Bank Bangladesh Limited. 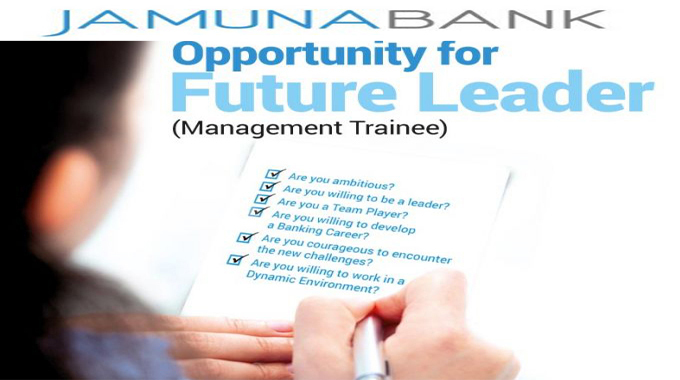 The authority of Jamuna Bank Limited has been requiting some management trainee officer in their different branches. They are invited to application for eligible candidates of this post. Jamuna Bank Limited is one of the renowned privet commercial bank in Bangladesh. It has business network with 102 branches across the country. For all the branches they are looking fresh blood as Management Trainee Officer to meet the growing needs of its expansion program. Some Important Date and Information. Application Start: 20th May 2016. Application Last Date: 15th June 2016. Academic Qualification: Applicants should have MBA in any discipline, Masters in Finance/Accounting/Management/Banking/Statistics/Economics/Human Resources/B.Sc in CSE/ Textile Engineering/Mechanical Engineering/ EEE, CGPA 3.00 out of 4.00 or equivalent class in graduation and post graduation degree from any reputed university or institutions. Candidates should have minimum GPA 4.50 out of 5.00 in SSC and HSC levels or minimum “B” in O and A level. zoom=1.5&resize=250%2C99&ssl=1″ alt=”Dhaka Bank Job Management Trainee Officers” width=”250″ height=”99″ />If you think you are a right person for this job then apply through via online with a recently snapped passport size photograph. Canvassing in any form will automatically disqualify the candidature. You must be apply into June 15,2016. Only short listed candidates will be called for written examination. Career Plan and Remuneration Package: In probation period, the management trainee will received monthly 50000 TK along with others admissible benefits within rules of the company. After complete successfully probation period they will be absorbed First Executive Officer in the regular scale of the Bank on satisfactory. After complete their application process they are announce written exam date and time. They are provide seat plan and time by candidates mobile number. So, you must be put a valid number in application Form. The number that you give your job application form that must be open for all time. They are known to you on your mobile phone by SMS. After finishing written exam result the authority of Jamuna Bank Limited will be published result. We are also published written exam result at the same time. So, you can see your result from our website. If you face any trouble to apply then visit their official website. For visit their website please clink this Link. Jamuna Bank Limited.